I finally obtained a third Willie Gregg single, which makes me now the owner of three of four known Gregg singles. My favourite still remains his Waterflow 45. This Kay-Bar Dane release is much in the vein of his Bridge-Way recordings with slight soft teen sound and a soft country feel. The steel guitarist does some nice fills on these two numbers and Gregg sings with a calm, deep voice. 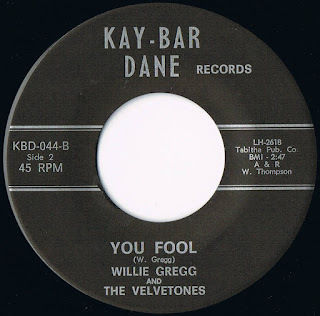 Apparently, Gregg also released another version of "You Fool" on the Louisiana based Ringo label. All I could say about Willie Gregg has been said in this post about his Bridge-Way single. More of interest today is the Kay-Bar Dane label. 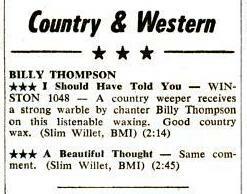 I know of several releases on this record label, of which two are of greater interest: one by Gregg and one by Texas western swing band leader Billy Thompson. A certain W. Thompson is mentioned on the Gregg single label as the A&R head of Kay-Bar Dane, which leads me to the assumption that Thompson was at least somehow involved in this venture. Information on Thompson's early life came from the sleeve notes of an LP he recorded for Jesse Smith's Bo-Kay Records. According to Smith, Thompson took up the guitar at the age of nine years and began entertaining soldiers at Camo Barkeley during World War II. After he graduated from high school, Thompson joined the Miller Bros. Band. This western swing combo played in Texas and Oklahoma but by 1950, branched out performing also in New Mexico, Colorado, Arizona, and others states. It is said they rivaled Bob Wills' Texas Playboys in popularity at one time. However, they never found the recognition as Wills or other big names in western swing. 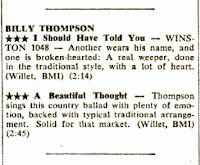 Billy Thompson began recording with the Miller Brothers in 1954 for the 4 Star label. The group also owned a nightclub called M.B. Corral Club in Wichita Falls, Texas, where they would play dances regularly. By 1957, Thompson had left the group and organized his own band, the Melody Cowboys. This outfit performed at nightclubs and dance halls around Odessa and Midland. That same year, Thompson and his band first recorded for Jesse Smith's Bo-Kay label. "Waltzing with Sin" / "A Love Gone Blind" was released on Bo-Kay #K-104. Sam Gibbs (bass), Lee Cochran (trumpet), Madge Bolin (piano). In 1960, Thompson also recorded for Winston Records and with Freddie Franks for his presumably own Thompson record label. 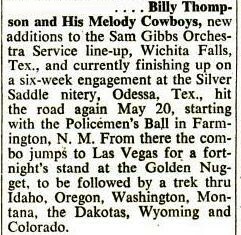 Also that year, he cut an album for Bo-Kay entitled "Big Balls in Cow Town" and became part of the Sam Gibbs Orchestra Service line-up (see Billboard clipping below from April 25, 1960). In April and May 1961, Thompson and his band backed George Jones at the Melody Club in Odessa. I'm not sure but this spot could have been Thompson's own nightclub. By September that year, Thompson took part in package tours organized by Harry "Hap" Peebles. On September 23, the tour kicked off with a show in St. Joseph, Missouri, that included Hank Snow, the Louvin Brothers, Bob Luman, Grandpa Jones, Margie Bowes, the Slater Sisters, and Thompson (with his - then billed - Melody Ramblers). The package mainly performed at state fairs in the Midwest. 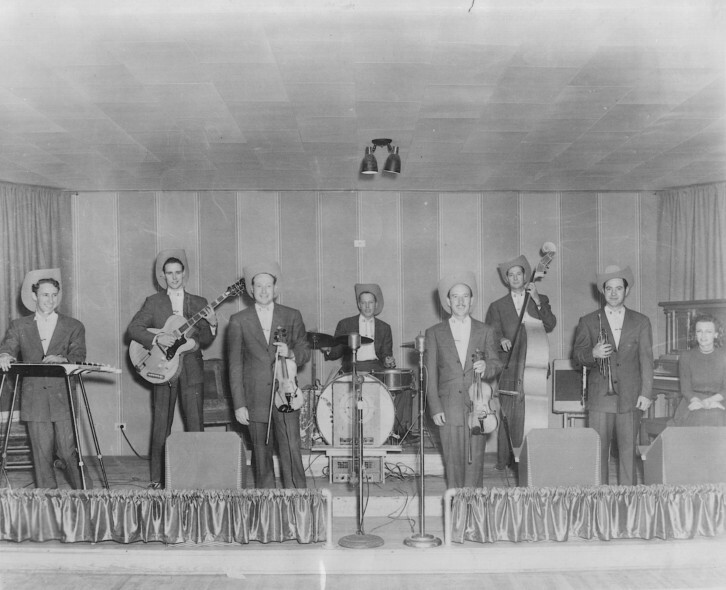 Apart from Thompson's outfit, also other western swing artists such as Merl Linday's band, Johnnie Lee Wills, and Mack Sanders performed on the same bills. In 1965, Jesse Smith issued Thompson's version of the Don Gibson hit "Oh Lonesome Me" on Bo-Kay. Two years later, the Kay-Bar Dane label came into existence. Based in Orange, Texas, both releases featured credits to Tabitha Publ. Company also from Orange. There were possibly more releases other than these two which still have to be located. Thompson kept on recording for other small labels afterwards, including Zak-Tone, BJB, and Circle J. You can read more about Thompson's Bo-Kay LP on Hillbilly-Researcher. 024: Doug Burch - My Home in Arkansas / ? 036: Tee Collins - You Can't Take My Life / ? Willie Gregg also issued this on Ringo (LA) 45 - 702 same song alt version.